This entry was posted on June 6, 2008 at 6:04 am	and is filed under business, Marketing, strategy, Web 2.0. You can follow any responses to this entry through the RSS 2.0 feed. You can leave a response, or trackback from your own site. Thanks for the analysis. The legends did not come through as well – you may want to fix. Here is what would have represented my point better. Show what investors have seen in returns versus what the 30 to 50% premium if there had been a buy out within a year of Jobs or Hurd coming in. Instead, like many you are making Jerry the issue. I have said in in both my posts, may be he should move on or in to background. My point is why does Yahoo need to be sold to accomplish that? Icahn got what he wanted at Motorola and BEA. In your opinion, is Motorola better now months after Zander is gone. You know about the exodus of key employees happening at BEA …who really benefited? I am a big fan of selective, strategic M&A and have written how firms like GE, Cisco etc do it. But this mob mentality of any management which does not accept a buy out offer offer is guilty of shirking fiduciary responsibility is a bit of a stretch. And ignores all other stakeholders – customers in particular. My readership is enterprise customers not investors. I usually write with them in mind. I have asked many times on my blog how does all this M&A activity help customers. Few of the supposed M&A benefits in product and overhead rationalization flow through to the customers. In fact in many cases, their prices has gone up, instead of volume discounts and the quality of product/service often deteriorates as the new owner squeezes costs and keeps the margins. If the trend continues I will recommend to my CIO clients they seek warrants along with any license or product they buy. That is the only way they can have any say in any buyout decision. And they deserve a say. 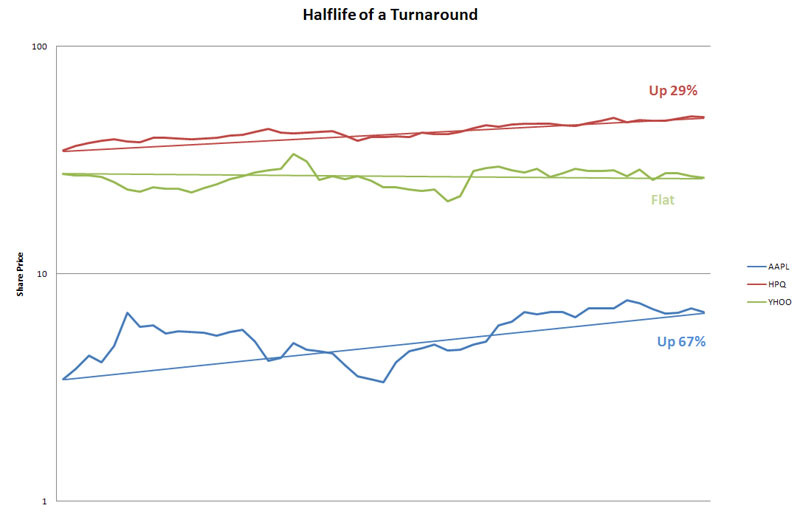 Showing total return on Apple or HP years later versus a quick 30-40% may be interesting, but you’ve completely overlooked that in those two cases investors had a reason to believe very early on and therefore to stay in the game. Apple and HP gave them the 30% or more in the first year, and Yahoo hasn’t offered up anything so far but the promise that if the strategy does fail, there will have been so many poison pills that it isn’t possible to sell and salvage. I agree, I have made Jerry the issue. Jerry is clearly in control and has taken huge steps to block an acquisition that some are saying are unfair, not appropriate in the context of fiduciary responsibility, or otherwise bad. They’re steps that radically shape the value of the organization, at least to an acquirer. I think you’ve misinterpreted my post if you think it’s about mob mentalities who insist on M&A at all costs. I don’t think that phenomenon exists really. Rather, you have a group that insists on having some confidence. What I’ve shown here is that they appear to have had confidence early on with 2 of these CEO’s but no the third, and also that the confidence was well placed when we look at the performance of the stocks in these timeframes. It is the curse of the CEO that they get more credit for successes than they deserve as well as more credit for failure. Your point about who invests more money, customers or investors, is one that carries zero weight for me. Why? Because both parties entered into an agreement with open eyes. The customer got value for product and was never promised anything more than that. The investor bought into share appreciation and has every right to expect the company to deliver on that. We’re back to my graph of who did or did not, and to the surprising conclusion that you can tell pretty quickly. It doesn’t seem to take years for a turnaround to start to take root. As for Motorola, what does Motorola deliver to customers? Trendy new cell phones? If they miss a generation and are no longer trendy, how are they delivering? And BEA under Oracle’s wing. How exactly are customers harmed there? The real truth is that the customers themselves were not that loyal to any of these companies. They started voting by not buying before any of these investors ever got involved. If the numbers had stayed good, the investors never would have gotten interested in any M&A activity. So I find your customer angst a little bit misplaced given that many of them were clearly also very unhappy with these companies and hence quit buying. Bob – most of us in tech are spoiled when it comes to customer aggressiveness. Spend some time in auto, retail, aviation…you will see what customers can dictate. CIOs are wimps and helpless when it comes to tech M&A and the frequent resulting margin increase and decline in product/service in acquired company. Just because they slow down new purchases from a BEA is not a signal that they are happy Oracle bought it if talent leaves, rates go up etc. Survey after survey of CIOs shows growing concern about consolidation in various sectors. It cannot continue as it has the last few years. Warrants are just one mechanism – and frankly a clumsy solution. But Their voice is not being factored enough. Vinnie’s point is spot on. In auto the customer is king and he kicks the tier one vendor and before long the entire supply chain feels it. Silicon Valley was clever to avoid this fate. This expains why the industrial world really despises the tech world, deep down. It also explains why the tech world is so dynamic: That much price power leaves a lot of room for new market entrants. SaaS anyone? It also explains why customers have so little voice in tech products. Again, SaaS anyone?